At least five people died and buildings were torched in clashes between government forces and suspected rebels in Congo's capital, the government said Tuesday, saying some 50 people had been arrested over the "terror attack". A dozen attackers were also killed in the fighting in the south of the city on Monday, which saw six police stations, a town hall and two customs checkpoints set on fire, government spokesman Thierry Moungalla said on Twitter. Heavy gun battles erupted before dawn in the southern Makelekele and Mayana districts of Brazzaville, which are loyal to the opposition, sending thousands of panicked residents fleeing. "Three members of the security forces, two civilians and 12 attackers" were killed in the unrest, government spokesman Thierry Moungalla said on Twitter, adding that "six members of the security forces were injured, as well as some civilians". "In the course of the police operation during the assault, security forces arrested around 50 former militia members, the perpetrators of the attack." The government blames the fighting, which comes on the heels of a disputed election last month, on the disbanded "Ninja" Nsiloulou militia that fought two civil wars in the 1990s. 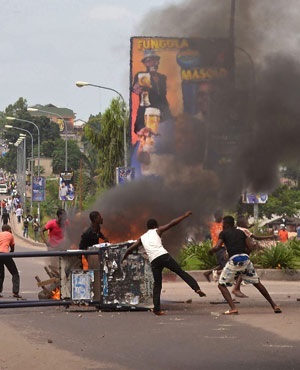 The Ninjas are headed by Protestant preacher Frederic Bintsamou, known as Pastor Ntumi, who recently came out in favour of opposition presidential candidate Guy-Brice Parfait Kolelas, the runner-up in the March 20 vote. "The overwhelming evidence held by relevant services clearly points to the active implication of Mr Bintsamou in the events of Monday," Moungalla said. Congo's constitutional court on monday confirmed that former paratrooper colonel President Denis Sassou Nguesso had won, extending his 32 years in power despite accusations of rampant corruption and nepotism. Five defeated candidates have disputed the results of the poll, in which Sassou Nguesso took more than 60 percent, alleging "massive fraud". Congo has been on edge since an October constitutional referendum ended a two-term limit on presidential mandates, allowing the 72-year-old head of state to run again. Last week, there were strikes in several southern districts in protest over the election results. The southern Makelekele and Mayana districts remained eerily quiet on Tuesday morning and few residents appeared to have returned home after fleeing the fighting in droves the day before. Troops deployed at key points throughout Brazzaville and manned roadblocks, searching the few cars and people out on the streets, while stalls were empty at the city's biggest Total market. "We live in a country where, whether you vote or not, peace is always under threat," said one woman, who gave her name as Julienne. Moungalla said the March vote was "a great moment of peaceful democracy" and said authorities were investigating whether the opposition was behind the unrest. The government "does not yet have proof that candidates or their supporters are involved in this affair" but investigations "are ongoing", he said. Kolelas, who came second to Sassou Nguesso in last month's vote with 15%, said the government allegations against the rebels were "overly hasty". "I want a totally impartial enquiry carried out," Kolelas told AFP in an interview. "It's a masquerade," he added. "I'd like to see proof... of what happened." He also disputed a ruling by the constitutional court that his request to have the results of four regions annulled was "inadmissible as it was filed after the constitutional deadlines". Sassou Nguesso served as president from 1979 to 1992 and returned to power in 1997 following a civil war. He won two successive terms in elections in 2002 and 2009, both of which were disputed by opposition parties.